Take a virtual tour of the Alora Spanish Colonial, an impressive one-story home design. 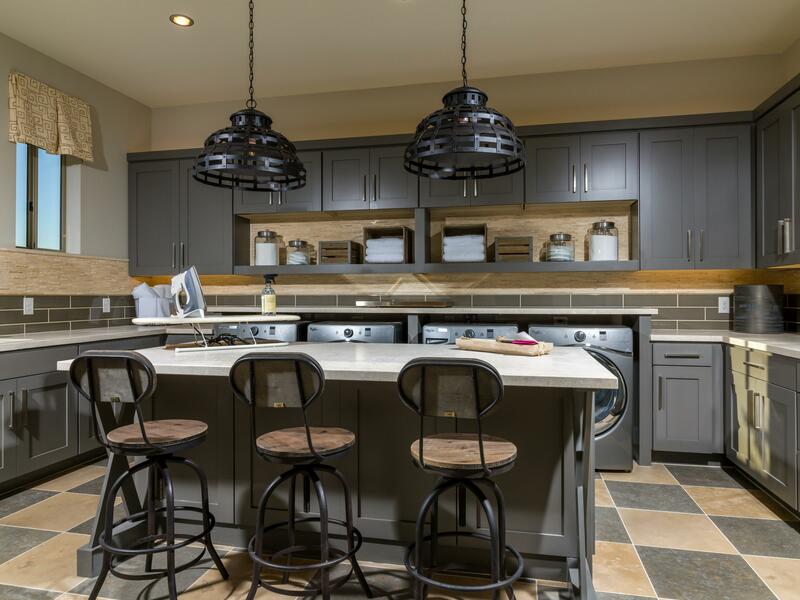 Muddy boots, dirty paws, smelly sports equipment, rain gear, pool towels, winter coats, heavy book bags – if you are confronted with any (or all) of these items on a regular basis, you might want to consider adding or updating your current mudroom. What is a mudroom you ask? 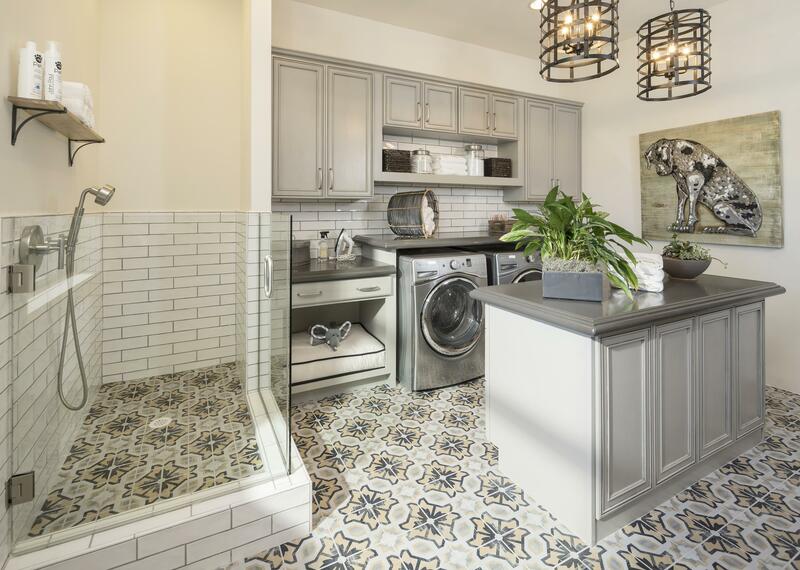 This useful, transitional area acts as a boundary between the outdoors and indoors, helping to prevent dirt, grime, and smells from seeping into the rest of your home. 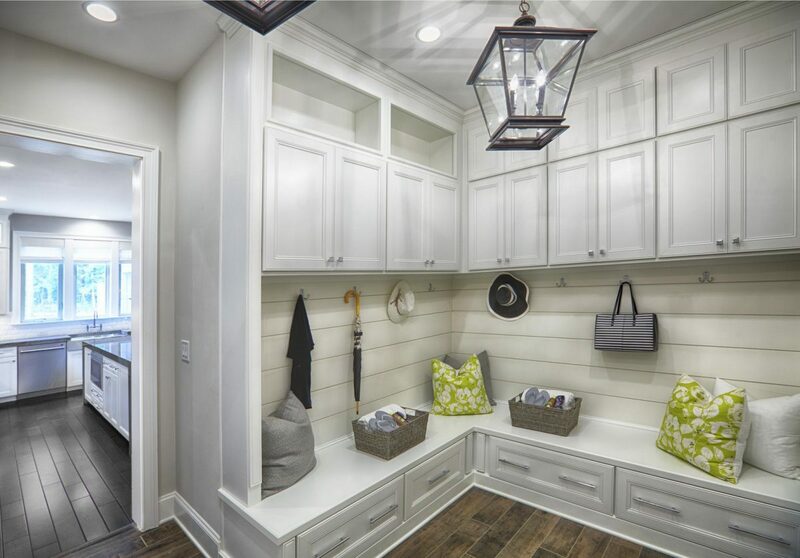 Easy-to-clean floors, hooks and storage for all your items, benches to sit on, and cubbies for shoes and extra gear are all defining characteristics of a great mudroom. To keep it all organized, a mudroom should be thoughtfully designed with the specific storage, space, and features that fit your family. We’ve compiled some key ideas to consider when building your new mudroom. Take some time to think through and write out all your storage and function needs. Depending on your family size or the number of pets, your needs can drastically vary. Is it just a place to dump mail and hang coats or is it a central hub where schedules are posted, pets are bathed, clothes are washed, and items are stored? Your list of functions will help define how much space you need for your mudroom. If you’re simply looking for a designated area for your coat rack or small catch-all table, then a front hallway or nook off the kitchen might do. 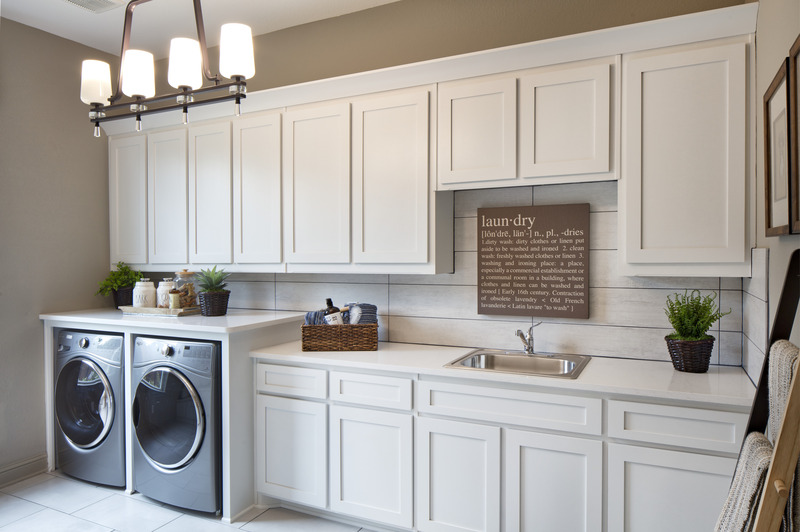 Should your needs include a washer, dryer, and sink or additional storage, you might want your mudroom to be closer to the size of a small bedroom. Regardless of the size of your space, maximizing your storage is a must. Flip benches, cabinets, and cubbies can be used to keep items organized and floors cleared. Assign each member of your family a specific space to prevent kids from grabbing the wrong keys, shoes, or bookbags on their way out the door. Individual cubbies or name placards help this room feel much more personal. 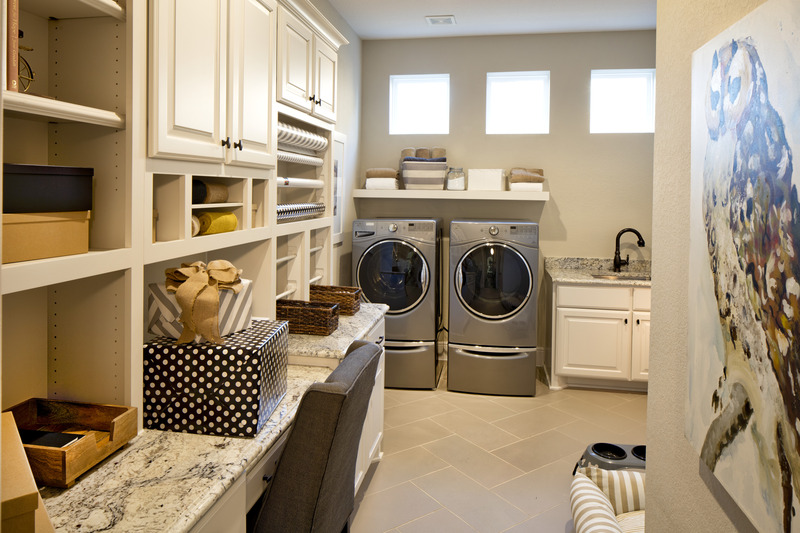 For more organization ideas, see Toll Brothers’ blog featuring tips from professional organizer, Amanda LeBlanc. The flooring you choose for your mudroom should be durable, easy-to-clean, long lasting and waterproof. Natural products like slate, brick, and stone stand up well to the elements all year long and are ideal for high-moisture areas. As a bonus, the natural materials add a sense of refinement to an often-forgotten space. 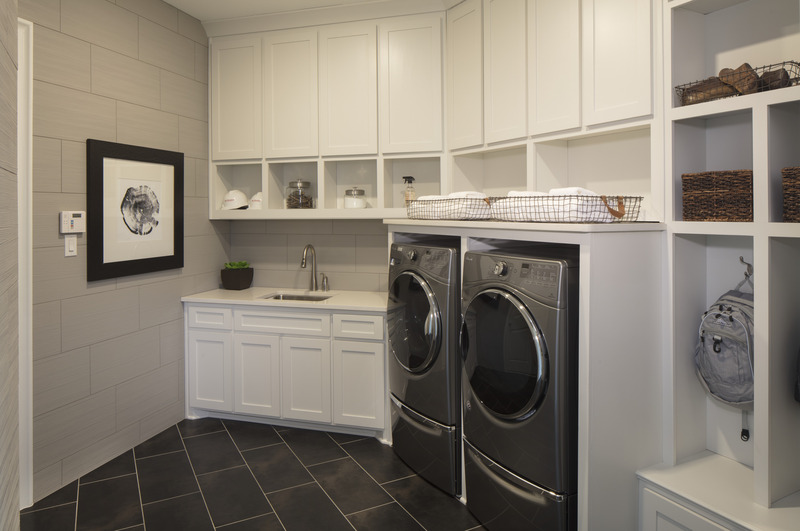 If you have the square footage, including your washer and dryer in your mudroom helps to keep messes centralized in one location of the house. Dirty laundry, wet clothes, and stinky sports equipment can be thrown directly into the washer instead of carried throughout the house. Adding a separate oversized wash sink always comes in handy when cleaning, especially when it comes to your pet. If your four-legged friend has never met a mud puddle they didn’t love to jump in, you may also consider a pet spa to keep them, and your floors, squeaky clean. Although a mudroom functions as a workhorse, it can still look as welcoming as the rest of your home. Personalize your space with a cheerful paint color or accent a wall with patterned wallpaper. The sky is the limit when it comes to accessories. Chalkboards, monogrammed storage bins, framed artwork, and family pictures make it easy to add your personal touch.